I'm glad I got this book. Lots of info for the price and a different slant than a lot of "exercise" books. The first two chapters explain why Brady discarded traditional training methods, e.g. lots of weightlifting, for his new methods. The "why" helps. Then he explains pliability, there are 120 pages of exercises, then stuff on hydration, diet and getting proper rest. Some of it is basic, e.g. avoid salt, but some of it is rather unique in my experience, e.g. avocado ice cream. And some I found surprising, like seeing salmon on the list of acidifying foods. Whether or not you buy into Brady's ideas, if you are interested in personal health, from an exercise or nutrition standpoint or both, I think this book is worth a read. I figure for the $24, or whatever it was, there are more than enough interesting ideas to make me glad I bought it. This book is a summary of Brady's healthy life style and exercise routine. As a nurse practitioner trained as a Certified Strength and Conditioning Specialist, I found his beliefs to be pretty well grounded in science and commonly accepted practices and enjoyed the content. It is comprehensive and well-thought out. It's his way of telling his story and then thoroughly covering all aspects of life that lead to achieving a lifetime of sustained peak performance that makes it unique. If we all did what he suggests, we'd all be fit, healthy, and happier. If coaches followed these guidelines, we'd have less injuries nation wide. It should be required reading of all high school athletes and especially the coaches who still don't get it. It's totally worth the money because the concepts apply to all people, not just those who exercise or are athletes. His main point of adding pliability (lengthening and softening muscles) to your strength and conditioning routine is not a new concept but it is rather new to see a professional athlete embrace it so thoroughly. It really is one of the main secrets to his athletic longevity and all of us should add pliability exercises to our routines as well as follow his 12 principles. To discredit an earlier review - Brady does NOT say you have to go to one of his centers to achieve pliability. He discusses self pliability exercises, partner pliability exercises, and then professional therapists at his centers (which would probably be for the amateur and professional athletes or those who are really into this). There is a bit of a sales pitch tone to it though with some annoying repetitious phrases - but maybe the athletes need it drilled into them. It seems it was written so that you'd get the same couple messages with each page. He could have said the same stuff in less pages. I highly recommend starting this book with the conclusion on page 284 for a summary of what's to come. Move on to the middle and if you haven't had enough, then hit the verbose beginning chapters. 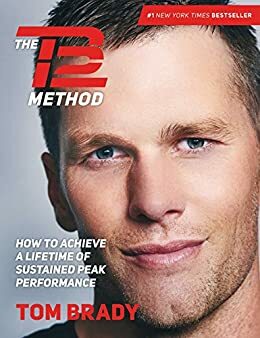 There are a ton of good pictures to help with understanding the exercises and if you are a Brady fan you'll like his personal touch. I'm glad I got it and highly recommend it. If I had a kid in sports, I'd buy it for them no matter how young and read it with them. I'm ordering my husband his own book and I'm recommending it to all my friends. It's really that good. I am not a Patriot fan, nor a worshipper of Tom Brady. I am a middleaged female yoga teacher. But I like Tom Brady's TB12 program very much and I think this book is worth reading. Especially for aging athletes--whether in sports or yoga, Tom and his trainer Alex Guererro have developed some key strategies for improving fitness, notably muscle pliability, which I've taken to the yoga studio with good success. I add this technique of self-massage to my stretching in yoga class. I also respect his nutritional plan, his supplement list (although mine is more sophisticated than his, and each person should personalize his or her supplements, especially using blood tests to target deficiencies like the common deficiency Vitamin D) and his concern about hydration, sleep and mental focus. To scoff without testing his program in your own life is just prejudice, not science. To dismiss the whole because Tom Brady sells merchandise based on his program is also illogical. You can do his program, as I do, without buying a thing. You don't buy muscle pliability. You use intelligence & hard work to heal your injuries and improve mobility. Just do it. Namaste, Tom. 5.0 颗星，最多 5 颗星Life Changing for Seniors !! Interesting book. A bit repetitious at times but the knowledge is valuable. I bought a Physix gear sports stick $11 on Amazon to massage my muscles and it works well to put Tom's plan into action. Also began using bands to work our with at the gym. Was very suprised to see how fast my muscles reponded and became more "pliable".